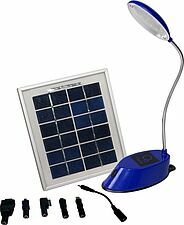 The Firefly Mobile is an award winning solar light that provides phone charging and a bright task light with three brightness settings. The light from the lamp is 8 times brighter than a kerosene lamp and after one day of charging the lamp provides 3.6 hours of light on high setting, 14 hours on medium setting and 50 hours of light on low setting. The high performance lithium iron phosphate battery will last for up to 5 years before it needs to be replaced.